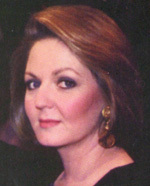 Maureen Reardon Bauer was first portrayed by Ellen Dolan (Margo on ATWT) and later replaced by Ellen Parker, who was in the role up until Maureen's death in 1993. She and Ed were married ten years when she died, which would make Michelle a lot younger than she is right now but that's none of my business! 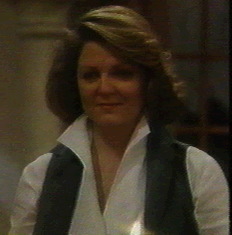 Maureen was Bea Reardon's daughter, and she had two sisters, Nola and Chelsea, and a brother, Tony (who I had a huge crush on as a kid in the 80s). Maureen was the level-headed one, and she fit naturally into the Bauer clan. 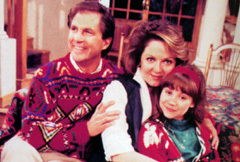 Maureen was Ed's fourth wife, after Holly, Rita, and Leslie. With Maureen's help, Ed overcame his alcoholism and devoted himself to being a good father and husband. 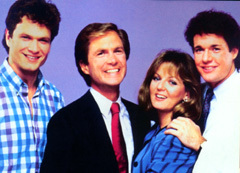 At one point when Ed and Claire Ramsey thought Maureen and Fletcher were dead, in their grief they made love and Claire got pregnant. Maureen forgave her husband and Claire actually moved in with them. When Michelle was born, Maureen devoted herself to raising her husband's daughter while Claire split her time between the hospital, her teaching, and various affairs with her students. Maureen got fed up with Claire's neglect of Michelle and she and Ed sued for custody and won. Maureen is the only mother that Michelle ever knew, and she loved her mother as much as everyone else in Springfield and the GL audience did. I'm not sure if Michelle knows that Maureen wasn't her real mother, but she must because she dated J, who is Maureen's nephew. Anyway, Maureen and Ed were happily married until 1993, when Ed helped Lillian Raines through her breast cancer scare and had a one-night stand with her. He kept the secret for months, but then Maureen found a letter Lillian had written them behind the counter in the kitchen. She confronted Ed about the affair, then got in her car and drove off to be alone and think. She had a terrible car accident, however, and was killed. Ed donated her organs, and commented that it was a lucky person who got Maureen's heart. That turned out to be foreshadowing, since it is Michelle's fiance Jesse who got her heart. Ellen Parker has been back on GL this year playing Maureen's ghost, giving Michelle advice about graduation and her relationship with Jesse. It's been great having her back, but it's also a sad reminder of what we are missing not having Maureen on a daily basis. She and Ed were the anchor couple of Springfield, everyone gathered at their house not just for the Bauer Barbecue but just to be there in a home filled with love and family values. 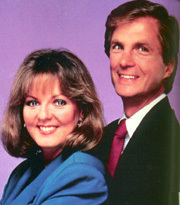 Since Maureen's death that has been sorely missing from Guiding Light, and the Bauers just aren't what they used to be. Last updated 1/3/98. E-mail me with any commments or suggestions.